Secondary growth is responsible for increase in diameter in roots and stems; secondary tissues are produced by lateral meristems or cambia. There are two basic types of cambia, a vascular cambium, which produces vascular tissue, that is, secondary xylem and phloem, and a cork cambium or phel-logen, which produces tissues to replace the epidermis (see the following sections). figure 7.26 Cross section of Pinus sp. stem showing radial files of vascular cambium initials (C) (Extant). Bar = 100 pm. the cambium begins development as a complete cylinder (a ring, as seen in cross section) between the primary xylem and phloem. If the primary vascular tissue occurs in bundles, as is the case in woody dicots and gymno-sperms, the cambium begins development within the bun-dle—the fascicular cambium. Then, parenchyma cells between the bundles become meristematic—the interfascicular cambium—and connect the fascicular cambia together so that the cambium eventually forms a complete ring around the axis, between the primary xylem and phloem. Cambial cells or initials divide primarily by periclinal divisions (parallel to the surface of the axis) on their inner and outer faces, producing files of cells along the radii of the axis. The presence of these orderly files is one way to distinguish secondary growth in fossil axes. Cambial initials must also divide anticlinally (perpendicular to the surface) to produce more cambial cells as the circumference of the axis continues to increase due to the production of secondary tissue. There are two types of initial cells in the vascular cambium. Fusiform initials are elongate cells that produce the conducting cells in both the secondary xylem and secondary phloem and the other cells in the axial system. Ray initials are shorter, generally rectangular cells, which give rise to cells in the ray system (see section "Secondary Xylem") . 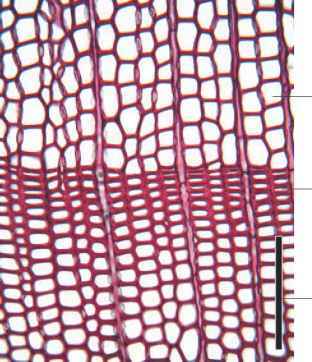 Generally, many more secondary xylem cells are produced than secondary phloem; indeed, in most living trees the bulk of the trunk represents secondary xylem or wood. The vascular cambium in roots arises in the same place as in stems, that is, between the primary xylem and phloem, but since the primary xylem in many roots is lobed or furrowed, the cambium initially also has this shape. As the root continues to develop, however, more secondary xylem is produced in the furrows so that the cambium eventually has a cylindrical shape, just as it does in stems. See section "Secondary Xylem" and "Phloem" (later) for the cell types produced by the vascular cambium. 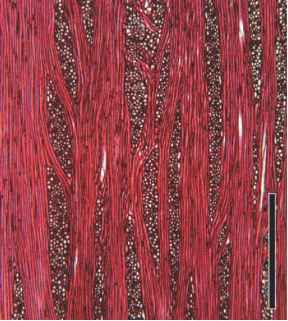 As the vascular cambium continues to produce cells, the stem or root increases in diameter and the peripheral portion of the cortex and epidermis, which are not meristematic, would eventually be split apart. In older axes, therefore, periderm tissue performs the function of the primary epidermis, that is, to protect the plant from infection and desiccation. The periderm includes the phellogen or cork cambium, cork cells (phellem), and sometimes phelloderm. Like the vascular cambium, the cork cambium produces cells to the inside (phello-derm) and the outside (cork). Also like the vascular cambium, the production of cells is not equal on the two faces, but, in this case, more cells are usually produced on the outside (cork) than on the inside, with the exception of some members of the Lepidodendrales (Chapter 9), which produce more phelloderm than cork. Phelloderm cells are parenchymatous, but cork cells are non-living at maturity and their walls are impregnated with suberin; they thus prevent water loss and also provide a barrier to infection by fungi and bacteria. The cork cambium can arise close to the outside of the stem, that is, subepidermally, or deeper within the cortex or in the secondary phloem. It can even arise in the epidermis itself. The process of development is the same as for the vascular cambium which parenchyma cells become meristem-atic and produce files of cells by periclinal divisions of the cork cambial initial cells. The cork cambium also undergoes anticlinal divisions to increase in circumference. The cork cambium may initially arise in certain areas of the axis but eventually becomes continuous around the stem or root. As the stem continues to increase in diameter, the older (i.e., outermost) phellem ruptures and may be sloughed off the outside of the stem. Newer cork cambia then differentiate inward of the original cork cambium, initially within the primary cortex but later within the secondary phloem. It is the arrangement of these subsequent cork cambia and the amount of cork they produce that gives the outer bark, or rhytidome, of particular species its characteristic appearance. Smooth bark (e.g., in some species of Betula) forms where there is little cork produced, whereas rough, fissured bark (e.g., in Quercus) results from extensive cork production. The fossil aquatic angiosperm Decodon allenbyensis, from the Eocene of British Columbia, has a very complex rhytidome, and the same structure does not occur in living species of this genus (Little and Stockey, 2006). Roots of D. allenbyensis produce a lacunate phellem, with alternating elongate and isodiametric cells. figure 7.27 Cross section of Pinus sp. stem showing 3 years of growth and resin canals in wood (arrows) (Extant). Bar = 250 pm. primary phloem, primary cortex, phelloderm (if present), cork cambium, and phellem (cork). In older trees, the bark may consist only of secondary phloem, cork cambium, and phellem. In roots, the cork cambium may also arise near the surface of the axis but most commonly arises in the pericycle. Secondary xylem (wood) is a much more complex tissue than primary xylem and consists of a number of different cell types arranged in specific ways. 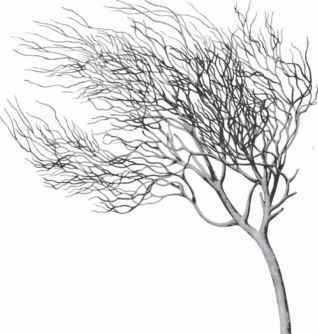 Wood includes an axial system, which moves water and minerals up the stem, and a ray system, which runs horizontally through the stem, that is, in a radial direction. The axial system contains the vascular tissue, tracheary elements (tracheids and/or vessels), and axial parenchyma (vertical strands of parenchyma). In certain angiosperms (hardwoods), the axial system may also contain support cells such as fiber-tracheids or libriform fibers, a type of xylary fiber. Gymnosperms do not have fibers in their wood (although fiber-tracheids may be present) and are called softwoods by foresters. Some conifer wood contains resin ducts (FIG. 7.27) or canals in both the axial and ray system, that is, they are oriented both vertically and horizontally. Resin ducts form by the separation of parenchyma cells during development; at maturity, they are hollow tubes which are lined with an epithelial layer, whose cells produce the resin. Resin ducts also form in many conifers as a response to wounding or infection by various pathogens. The ray system extends at right angles to the tracheary elements and is involved in conducting water and nutrients in a radial direction in the mature axis, as well as storage figure 7.28 Tangential (A) and radial (B) section of Pinus strobus wood showing vascular rays (arrows) (Extant). Bar = 360 pm. in the older secondary xylem. It consists of vascular rays, which are principally composed of parenchyma cells (homo-cellular rays). Some conifers have ray tracheids in their rays (heterocellular rays); these are shaped like parenchyma cells but have pitted walls and are non-living at maturity. Vascular rays in conifers are usually uniseriate or biseriate, that is, from one to two cells wide (FIG. 7.28), and can range from one to usually 20 cells high (Evert, 2006). In gymnosperms (e.g., Ephedra) and angiosperms rays range from uni- to multiseriate in width and from one to many cells high, up to several centimeters (FIG. 7.29) (Evert, 2006). Both ray and axial parenchyma cells in the wood may form tyloses where they border a tracheary element. The wall of the parenchyma cell extends through the pit cavity and balloons out into the lumen of the neighboring vessel or tracheid. Tyloses (FIGS. 7.10, 12.40) most often appear in xylem that is no longer functional and are thought to function as a means of sealing off tracheary elements, or perhaps as a host response to infection. Because of the complexity of secondary xylem, three different planes of sections are needed to fully characterize the anatomy of the wood and, in many cases, to classify isolated pieces of wood (e.g., fossils) to genus. A cross, or transverse, section is made at right angles to the axis of a stem or root; this is the section exposed when a tree is cut down. If the tree exhibits growth rings (tree rings), they will be visible in a cross section. A radial section is a longitudinal section which is cut along the radius of the axis. A tangential section is also a longitudinal section but is cut perpendicular to a radial section on a tangent to the surface of the stem. figure 7.29 Tangential section of Ephedra trifurca wood showing multiseriate rays (Extant). Bar = 650 pm. A cross section shows the tracheids, fibers, vessels and other cells of the axial system in cross section, and the cells appear as squares, rectangles, or polygons. The vascular ray cells in this section are in longitudinal section, since they are elongated along the radius of the axis. In a cross section, you can measure the width of tracheary elements, but not their length; conversely, it is possible to measure the length of ray cells, but one cannot determine their height. In a radial section, tracheids and fibers appear in longitudinal section as very elongate cells with tapered end walls. Secondary wall patterns can best be seen in a radial section, as pits are more common on the radial faces of the cells. Vessels, if present, are revealed as elongated series of cells, one above the other, and perforation plates in their end walls appear in side view. Vascular rays also appear in side view and the cells that make up the ray look like the face of a brick wall that is many bricks (or cells) long and many bricks (cells) high. From this view, we get no idea of the number of cells that make up the thickness of the ray (or, to continue the analogy, the thickness of the brick wall). It is also very difficult to determine the height of rays in a radial section, as the cut would need to be exactly through the middle of a ray to reveal the full height.